Paying for private school is a challenge but there is a secret super power available to you to help called the snow ball effect. The idea is that small changes start to build upon each other, much like a rolling snowball, to have an out sized total result in a surprisingly short amount of time. Usually this is associated with compound interest over many decades enabling a comfortable retirement. However, unlike early retirees who strive to benefit from decades of compound interest we don’t have the luxury of waiting. We need the money right now! I first read about the more near term concept in the Tightwad Gazette and recommend you get a copy (from the library, of course) if you haven’t read it. Earlier I spoke of the power of moving to a decent, but not the best, school district as a savings enhancer. A small house, with its smaller mortgage or rent has other financial benefits – lower utilities being one of them. And this includes the peer pressure effect of self-reliance in the blue collar neighborhoods you will now likely reside. Wastefulness is correctly seen as a source of shame and embarrassment. In such a neighborhood you feel pressured to do simple chores (like raking the leaves) yourself. This social pressure changes your outlook in a most valuable way and is the true turbo boost benefit from a smaller house in a decent, but not the best, school district. 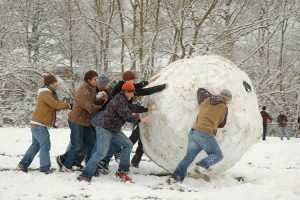 Here is a real life financial snow ball example. When we moved here the 30 year old home did not have cable. It *never* had cable. Ever. To get it installed would have meant drilling, installing and all sorts of mysterious things. So we skipped it and learned most folks on the street do the same. Fast forward ten years. That one decision to avoid a $120 a month extra expensive saved us many hours of time, protected us from adds to purchase stuff we don’t even know about and netted $14,4000*, tax free. Our house comes with a free car every ten years. All because the home wasn’t wired for cable and folks around here simply don’t do that sort of thing. Later, we sold an old Subaru for $4000 and replaces it with a used station wagon for $12,000. I couldn’t help but notice the net cost of the car ($8000) was more than covered by the cable savings. The savings on cable ($14,000) paid for the used car. The used the car was $45,000 new so that saved us and additional $33,000. Those very simple moves added up to a lot of savings we would have otherwise spent which went towards tuition expenses. With some of those savings we paid the tuition and we bought a coffee machine which saves another $1000 a year. In ten years we $12,000 saved on cable. We used those savings to pay for a gently used car and saved another $33,000. Those savings then funded a coffee machine which saves us another $10,000 over ten years. That is $55,000 in savings with three simple and repeatable steps that take less time and effort than the alternate steps. No need to tune into the latest shows (we can’t), nor to get our used car detailed (why would we do that) or drive to the coffee shop (we have it here). The savings go to the tuition payments. The extra time? We spend it leisurely looking for additional clever things to do . Once you start a snowball it is a lot of fun to keep rolling the sucker. Look for neighborhoods where folks are sweeping their own sidewalks, mowing their own lawns and washing their own cars. That is the correct place to live. Or starting living the way now – you don’t even have to move. Are you sure you can’t afford private school? Reconsider the power of the financial snow ball. * We have been here 11 years so total saving is actually $15,840 on the cable, a few thousand on items we never bought and a few thousand more for productive things we did with all that free time that we didn’t have to pay for. So it is more like $25,000 in savings but for this exercise you get the point. You can do this.